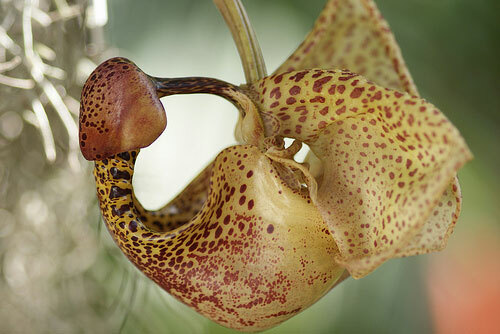 Coryanthes, the Bucket Orchid, is a relative of Stanhopea with even weirder-looking flowers. They are fragrant orchids. When male euglossine bees come to the flower to gather a scent to entice females (a single species of bee for each of a couple dozen orchid species! ), they fall into a water-filled "bucket" (a modified labellum, or "lip"), and can't fly out because they're wet! But there are some small knobs on the side of the bucket that allow them to crawl out past the column of the flower. The flower then contracts to trap the bee against the column until its pollinia have stuck to the bee or the bee has pollinated the flower; this process can take the bee 45 minutes or more! They don't like to dry out; water these orchids often. As for Stanhopeas, I recommend a moisture-retentive, but breathable, potting mix involving one or more of sphagnum moss, fine fir bark, rockwool, coconut fiber, or osmunda. They do well with bright, indirect light, about 3000 footcandles: basically, use Cattleya lighting. Intermediate-to-warm temperatures are best; 70-80°F (21-27C) during the day, dropping by 10 15°F (6-8C) at night. 50-70% humidity will keep them happy.